“We’re in the midst of one of the most active summer selling seasons to-date, with more single-family home sales than ever before. Home prices remain high, but inventory levels have increased steadily throughout 2015, perhaps taking a step toward a more balanced housing market,” explained Barb Cooper, 2015 President of the Austin Board of REALTORS®. Austin-area home sales hit an all-time high, increasing a whopping 12 percent year-over-year to 3,149 units for July, 2015. New listings were up nine percent and active listings increased five percent year-over-year, meaning inventory levels now equal three month’s supply for the first time since July, 2014. However, our area is still well below the 6.5 month inventory level, classified as a “balanced real estate market” by the Real Estate Center at Texas A&M University. Homes remained on the market two days longer than last year, or an average of 41 days. Sales volume repeated last month’s milestone, tipping the $1 billion mark at $1,065,785,348, an incredible 19 percent increase from this time last year. 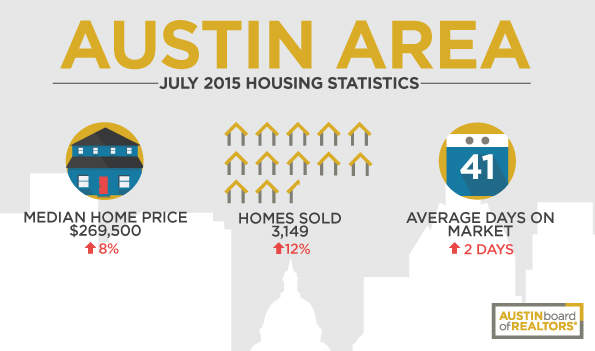 Compared to July, 2015, the average home price for Austin-area single family homes increased six percent to $338,452. The vast majority of pending sales and active listings were located in areas outside of the Austin city limits, including Cedar Park, Round Rock, Leander, Hays County, and Pflugerville, indicating that affordability is still a priority for area buyers. Interest rates remain at historically-low levels, and experts predict our real estate market will remain strong for the foreseeable future.